Clean room maintained virtually free of contaminants like dust or bacteria are required for types of laboratory work and in the production of electronic and aerospace equipment precision parts. 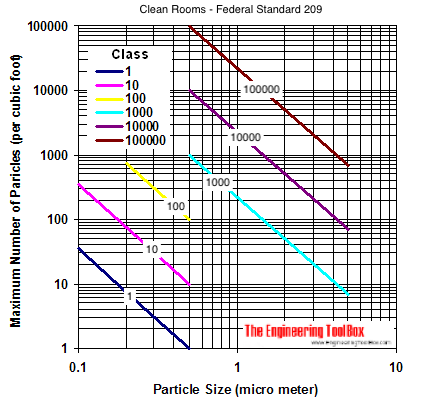 The air quality for clean rooms are described in Federal Standard 209 "Airborne Particulate Cleanliness Classes in Clean Rooms and Clean Zones" (A through D) where classes are named after the maximum number of particles of 0.5 micrometers or more in diameter which is acceptable in the air. 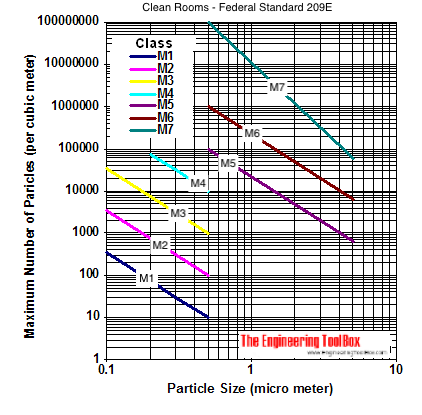 In a clean room rated as "Class 10000" there may not exists more than 10000 particles larger than 0.5 microns in a cubic foot of air. Class 1 & 10 - production laboratories for electronic integrated circuits ..
Class 100 - production areas for photo labs, medical implants .. Note! Federal Standard 209E is canceled and superseded by International Organization for Standardization (ISO) Standards - International Standards for Clean Rooms and associated controlled environments, ISO 14644. Engineering ToolBox, (2005). Clean Rooms - Federal Standard 209. [online] Available at: https://www.engineeringtoolbox.com/clean-rooms-d_932.html [Accessed Day Mo. Year].